Extended use from birth to booster. The Evenflo&reg; Symphony™All-In-One Car Seat accommodates children ranging from 5-110 lbs. with the most innovation and value on the market. Symphony provides exclusive safety features like SureLATCH&reg; that automatically tightens to secure the car seat in the proper position. The Infinite Slide™ Harness easily slides for an accurate fit every time. No reworking the harness as child grows, so parents can be sure children are properly secured every time. Extended use from birth to booster. The Evenflo® Symphony™All-In-One Car Seat accommodates children ranging from 5-110 lbs. with the most innovation and value on the market. Symphony provides exclusive safety features like SureLATCH® that automatically tightens to secure the car seat in the proper position. The Infinite Slide™ Harness easily slides for an accurate fit every time. No reworking the harness as child grows, so parents can be sure children are properly secured every time. Extremely satisfied with the purchase of this carseat. It had free 2 day shipping and it arrived the very next day! I was very surprised and excited. My daughter loves it and she even looks more comfortable on car rides. I only wish I would have bought it sooner. Bought this for our 9 month old! She was getting to big for her carrier. She LOVES sitting up and I think she feels more like a big girl! The installation was a breeze! Love the easy latches. And the buckles are much easier than our Graco. Love the color too! 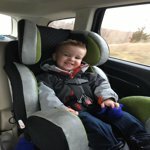 After months of researching convertible car seats I finally chose this one and we love it! My LO rides well and is comfortable as a growing 9 month old. I can see this lasting us for the years. It seems to be great quality material. My nephew has the graco version which is almost twice as much and I would choose the symphony over it for sure! So I purchased this car seat after watching the videos on YouTube about it reading all the reviews and checking it out in toys r us. Honestly the seat is very padded , it looks very safe .. And my son is very comfortable in it! If you have a small car like I do I have a 2010 Toyota camry it's pretty bulky, also it was difficult to set up the latch system was not as easy as they made it seem.. I am only using this seat forward facing and I honestly wouldn't recommend using it rear facing.. I would rather use a graco snug ride .. Or any smaller car seat that will click into my stroller. Overall it's a good car seat, it's big really big so keep that in mind if you have a smaller car .. This is such a cool looking car seat. I have a Toyota Camry and this installed in less than five minutes. (rear-facing) It has a quick latch system that snaps onto the built in bars of the car specifically for this purpose. Would have taken less time but, I had to find the little suckers wedged under the seat cushions since I didn't know what to look for. My 14 month old can sit up higher now, and looks super comfy. Harness are easy to adjust and again it just LOOKS cool! Wish they made these for adults, I'd put it in my living room. Really, the only complaint is the cup-holders are pretty shallow and are half-circles with an elastic band completing the circle. But, really, who cares? I don't want to give it 5 stars until I can try it forward facing, too.